The first national government was the Articles of Confederation, which gave much more power to the states. At the very end of the Revolutionary War, “The situation, and indeed the affairs of the nation, rapidly unwound. News of the peace treaty arrived, the officers were mollified by the promise of a bonus of five years’ pay, they were given notes for three months of back pay, and they were sent home on leave instead of being formally discharged. Congress fled Philadelphia after a group of drunken Pennsylvania soldiers threatened the delegates, adjourning to the tiny town of Princeton, New Jersey. So few of them actually went there that Congress barely had a quorum to ratify the treaty. Congress did, however, propose a set of revenue amendments and send them to the states. On the fate of the amendments rested the fate of the Confederation. During the next four years, as the states leisurely took up the amendments, the Union all but dissolved. Congress had a quorum about half the time, and the republicans who again dominated it were not particularly concerned that it do anything, apart from somehow retaliating for commercial restrictions that Britain had imposed after 1783. Congress did have accomplishments, notably auditing the accounts that constituted the public debts and providing for the survey and ultimate governance of the public domain, the Northwest Territory. It also negotiated a commercial treaty with Prussia, but that, like the Treaty of Paris, was limited by the absence of a capacity to give treaties the force of law.” [pp. 13-14] The nation limped along like this, barely getting any business done while the states looked to their own interests and not the national interest. “Then, early in 1787, came two developments that electrified friends of the Union into action. The first was Shays’s Rebellion, an armed uprising in central and western Massachusetts that was essentially a taxpayers’ revolt at base but was widely perceived as an anarchistic and leveling movement that threatened to destroy social order in America. The second was news that New York had definitely rejected the 1783 revenue amendments, thereby dooming the Confederation Congress to bankruptcy.” [p. 15] These events led every sate except Rhode Island to vote to send delegates to Philadelphia to the Federal Convention. The resulting constitution created a new government with substantially greater powers. Complaints later led to the Bill of Rights. “Two amendments in the Bill of Rights are especially relevant to questions of rights and sovereignty, the so-called declaratory amendments. The Ninth Amendment took care of James Wilson’s objection by providing that ‘the enumeration in the Constitution, of certain rights, shall not be construed to deny or disparage others retained by the people.’ The Ninth was understood as integral to a system of divided sovereignty. By refusing to nationalize unenumerated rights, the Ninth left the question of the protection of such rights to the states or to the people of the states. The Tenth Amendment, which Thomas Jefferson called ‘the foundation of the Constitution,’ provides that ‘the powers not delegated to the United States by the Constitution, nor prohibited by it to the States, are reserved to the States respectively, or to the people.’ In his Commentaries on the Constitution of the United States, Joseph Story asserted that the ‘sole design’ of the Tenth Amendment was ‘to exclude any interpretation, by which other powers should be assumed beyond those, which are granted.’ During the congressional debates concerning the amendments, Thomas Tudor Tucker of South Carolina proposed that the language be ‘powers not expressly delegated,’ but the proposal was rejected. A few days later, Elbridge Gerry attempted to insert the word ‘expressly’ but failed by a thirty-two to seventeen vote. Over the course of time, however, champions of states’ rights would come to argue repeatedly as if the word ‘expressly’ had been inserted.” [pp. 24-25] As we can see, the word “expressly” was decisively defeated not once but twice. The book delves deeply into a number of controversies in early American history, making it valuable for students of American history. 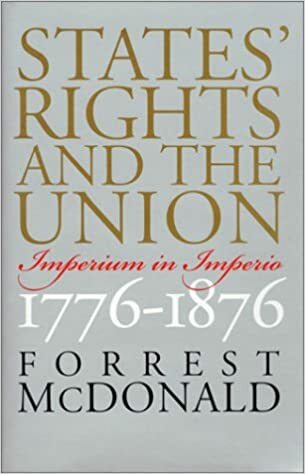 What I saw throughout the book was the concept of states’ rights was used historically as a bulwark against acting in the interest of the nation. It was used when a state didn’t want to cooperate with helping the nation in a war, when a state didn’t want to cooperate in making the United States a stronger nation, when a state didn’t want to cooperate in making the United States more fiscally solvent. It was especially used as a bulwark against any move that would or might be taken against the institution of slavery. What was also clear is that those who invoked states’ rights were the ones generally out of power. When in power, those same states’ rights advocates became staunch opponents of states’ rights. States’ rights was most often used in defense of slavery, and where states’ rights opposed slavery, states were unsuccessful in asserting them. Increasingly, the South, more and more identified as the location of slavery, became more identified with states’ rights to protect slavery. “Until the 1850s, the West tended to identify itself with the South, inasmuch as the lines of transportation and communication were along the north-south rivers. The construction of a network of east-west railroads would change the alignments drastically, leaving the southern states as an isolated minority. The isolation of the South had already begun; the coming of the railroad merely completed the process. The issue was slavery. Southerners had believed that the question of slavery in national politics had been settled by the Missouri Compromise of 1820, which admitted Missouri as a slave state but otherwise prohibited slavery in the Louisiana Purchase Territory north of 36º30′, the Arkansas-Missouri border, and permitted it south of that line. In the mid-1830s, however, abolitionists began swamping Congress with petitions, and though Congress could not constitutionally interfere with slavery as a domestic institution, John Quincy Adams (who served nine terms in the House after he left the presidency) insisted on reading the petitions on the floor. That seriously disrupted business, but the right to petition was expressly guaranteed by the First Amendment. Then in 1836 the House adopted what critics called the gag rule, under which abolitionist petitions would be received but tabled without discussion. In the meantime, abolitionists, having been expelled from the South, were sending propaganda tracts into the region by the mails. In the summer of 1835, the postmaster in Charleston impounded a shipload of antislavery tracts, and a mob seized and destroyed them. When the postmaster reported the incident to Postmaster General Amos Kendall, Kendall officially informed him that there was no legal authority to ban the publications from the mails. Unofficially, he suggested, southern postmasters could intercept such materials, on the ground that ‘we owe an obligation to the laws, but a higher one to the communities in which we live.’ ” [p. 133] He continues to trace the slave vs. free state controversies and tells us, “a number of northern states, beginning with Indiana in 1824, passed personal liberty laws refusing to cooperate. Vermont went a step further in 1840, making it a felony for a citizen to aid in the capture of runaway slaves.” [p. 135] This culminated in the Supreme Court case of Prigg v. Pennsylvania, which upheld the Fugitive Slave Law, said no state could interfere in any way, but also said that Congress could not requite state officials to enforce the law if the state prohibited it. New personal liberty laws were quickly passed prohibiting law enforcement officials in free states from enforcing the Fugitive Slave Law. These would be overturned by the Compromise of 1850. In writing about Reconstruction, McDonald said, “Southerners who complained of the ‘tyranny’ of Jefferson Davis were, when the war ended, to learn what real tyranny was like–but not at the hands of the executive branch. President Lincoln took the position that secession had never happened, that the war had been fought to put down an insurrection,a nd that it was the chief executive’s business to decide when legal governments had been resumed in the rebellious states. He was convinced that a large number of southerners had opposed the rebellion and devoutly desired a restoration of the Union. … He proposed to pardon all southerners, except high-ranking Confederate civil and military officials, who would take an oath of loyalty to the Union, and to grant recognition to the governments of each state in which 10 percent of the eligible voters took the oath, formed a government, and accepted emancipation of the slaves. … Lincoln’s approach was not shared by Republicans in Congress, who for various reasons proposed to impose stricter terms upon the South.” [pp. 208-209] The view of Congressional Reconstruction as a “tyranny” is an outgrowth of the discredited racist Dunning School of Reconstruction historiography and itself has been discredited. McDonald also shows unfamiliarity with the rest of Reconstruction. “Criticized for being excessively lenient, Johnson added further qualifications: that North Carolina repudiate its war debts, renounce secession, and ratify the Thirteenth Amendment, abolishing slavery, which had been passed by Congress in February. In the next few months, the same requirements were extended to the other states, except Texas, and though Mississippi refused to ratify the amendment, all but Texas were recognized by the president. A knotty constitutional problem inhered in this procedure. Either the southern states had legally left the Union or not. If they had not, no qualifications could have been imposed upon their ‘readmission,’ and their forced ratification of the Thirteenth Amendment was invalid. If they had left the Union and could not rejoin it until they met Johnson’s requirements, they were not states and had no legal right to vote on the amendment.” [p. 210] Here he’s completely confused. The states of the confederacy were still in the Union, but they were out of their legal relationship to the rest of the nation. Their governments were illegal and they needed to have the President [at that time] recognize their reformed governments as valid. Johnson placed his conditions of recognition on them, and thus when they satisfied those conditions he recognized their governments as being legal under the Constitution. The rest of the chapter shows a reliance on the Dunning School’s interpretation of Reconstruction, a view that, as has been said already, has been discredited. I found the book to be very useful in understanding early American history, which is something to recommend for students of history. It’s very good on the events leading up to the war; however, it’s very weak in the chapter on the Civil War and Reconstruction. I can still recommend it, though. I always explain to my students that the concept of states rights was born via the struggle between those in power and those not in power as a weapon for those not in power. It has remained as such ever since. We can see this occurring right now in the current and previous administrations via the political rhetoric and acts of Congress and Presidents. I don’t expect that to change any time soon either. I am going to have to pick this book up. It is also interesting to see just how pervasive the Dunning interpretation of Reconstruction has been. I’m teaching the second half of the survey course for the spring semester and I begin with Reconstruction. I’m going with the Foner interpretation. Foner’s good. So is Mark Walgren Summers. Kenneth Stampp is dated but still useful, as is John Hope Franklin. Might be good to sprinkle in a litte WEB DuBois as well.